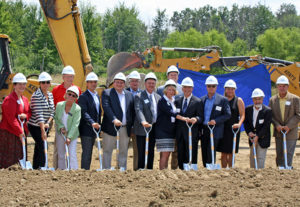 Work has begun on the expansion of the City of Medina’s Carlisle Brake & Friction facility at 920 Lake Road in the Medina Industrial Park. The City of Medina, partnering with the Medina County Economic Development Corporation, the Greater Medina Chamber of Commerce, the Medina County Port Authority, and the Team NEO/Jobs Ohio Regional Office, was able to offer a package that included a Job Creation Tax Credit and other tax incentives. Ted Messmer, President of Carlisle Brake & Friction, which is celebrating 100 years in business, said in his remarks at the July 21st ground breaking, “It is the pro-growth initiatives of the City of Medina, Medina County, and State of Ohio that brought us to this day.” Carlisle Brake & Friction (CBF) is a leading solutions provider of high performance and severe duty brake, clutch and transmission applications to OEM and aftermarket customers in the mining, construction, military, agricultural, motorsports, industrial and aerospace market. This $45 million project will bring 70 new jobs to Medina with an additional payroll of $3 million. The expansion accommodates additional steel processing and warehouse space for this global company with 50% of its sales outside the US. The project includes a 158,000 square feet addition of manufacturing and warehouse space that almost doubles the current facility. In addition to the expansion, Carlisle will also be making major façade renovations, as well as many interior improvements to the current building, including a conference room, enlarged cafeteria, renovated locker rooms for employees, new public entryway, new docks, and enlarging the parking area from 274 spaces to 346. Also included is a major electrical infrastructure project that includes a new sub-station. The company has already held its first Job Fair to fill positions that offer medical, dental and vision coverage, matching 401K, paid vacations, paid personal days, paid holidays, life insurance, a tuition reimbursement program, attendance bonuses, free uniforms, shoe allowance, safety glasses, and more. “We are very pleased to have worked successfully to have this company expand in Medina and bring these excellent job opportunities to our community,” stated Kimberly Marshall, Economic Development Director for the City.